Hello friends, I hope everyone enjoyed this beautiful sunny chilly weather. So far winter term has been wonderful. Our days are filled with excitement, creativity and adventure. It has been a while since I have written about the amazing people in our community. We are all so busy doing, that it is hard to find the time to celebrate what is being created. As some of you may know. The kids from our Thursday Young Entrepreneur's Club have opened their store. I am proud to announce they have brought in over $100.00 so far. Their store project includes: budgeting, paying rent, picking merchandise and profit sharing. Please stop by the store in the lobby. This week the kids will be selling their homemade chocolate. The hearts are made from organic, vegan, nut free safe chocolate. This Sunday Feb. 11th from 2pm to 5pm the Entrepreneur's Club will be hosting Afternoon at the Bijou featuring Mulan and their Valentine themed treats and decorations. The event is for ages 9-13. We will also have games and snacks as well as a movie for the younger ones ages 5-8 in the West room. I am very happy to announce our new Online Coordinator, Meredith Cook. She will be keeping the website and Facebook page updated, adding events, articles and information. One of the great features of our new website that Kimberly designed for us is the News, Teen and Kids pages. We would love for everyone to contribute. Please send stories, articles, pictures and testimonials to: Meredith at DifferentDirectionsOnline@gmail.com We have two articles that are being worked on currently: Michele Caines, another wonderful mom, is working on writing an article about Different Directions for her Website Uptown Birdies. She would love to interview parents, students and teachers for the article. Also 2018 marks Different Directions' 10 year anniversary!! whoo hoo. Yes 10 years ago, Erynn Albert, Rita Houston and Penny Kjellberg created and founded our happy homeschooling home. Erynn (my partner in this crazy venture) is working on an in depth piece about ancient DD and our journey to today. Along with our beautiful class experiences, this year has been filled with many community events. Joanna Lodin continues to host her monthly Fearless Homeschooling workshops covering topic such as how to file our paper work, preparing your homeschooled teen for college, Q and A panels with veteran homeschoolers and more. The next Fearless Homeschooling event will be in March. This year Rachel Lavine has kicked off a wonderful monthly series for parents called PUNK (Parents Understanding Neuro-Diverse Kids) and the group meets one Monday a month. This is a great opportunity to find like minded people who are going through similar experiences. Every month parents share their stories, wisdom and support. Laurie Heineman and her amazing troop of actors will be presenting a rousing innovative exploration of Shakespeare's A Comedy of Errors on Monday March 25th and Tuesday March 26th at the Medicine Show Theatre. Times and ticket information will be available on our website. Into Oz - As many of you know. The Wednesday Acting Out class is working on this year's Main stage production of an original musical based on the writings of L. Frank Baum. Once again we have an incredible team of artists, students, teen assistants and fantastic parents creating a one of a kind piece of theatre. Our show is called Into Oz. Our show will feature some familiar and some not so familiar characters and stories from L. Frank Baum's original 14 Oz books; as well as original songs written by the students of Acting Out and Jeff Lodin. Into Oz will open May 31st at the Medicine Show Theatre on 52nd street. More details will be available soon. Our next Teen Movie night will be Saturday March 17th. 7pm to 9:30pm. Today in Tinamarie's Stories class, the kids turned things around and read stories to us! How incredible it was to see them each thriving at their own level, and pushing themselves toward their potential in their own ways and at their own pace. Way to go, kiddos! Winter term has begun! A special thanks to everyone who has braved the cold to make it to our first classes. 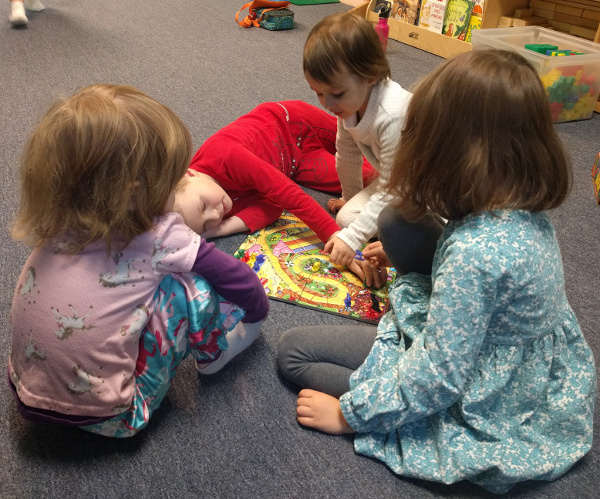 The kids in Tinamarie's Stories All Around Us class enthusiastically lead the way into the new term on Friday with a pajama party: complete with board games, blocks, restaurant play, crafts, and (of course) storytime! What fun was had by all! The 2016-17 Different Directions STEAM Team had a great year examining Motion. Our students harnessed the power of air and learned about lift and airfoils. They played with spinning motion and centripetal force. They found out about how their eyes react to spinning & motion & light and how mnemonics could capture memories in new ways. They explored ways of using engineering to find solutions for socially relevant challenges, especially those that focused on environmental concerns, and ways in which they could help the animals that bring them so much joy. They ended the term delving into chain reactions, using slope, runs, drops, levers and the collision of rapidly spinning spheres and they learned to look at the moments that did not work out as they had planned, not as taunts, but as happy guidance towards their ambitions. One subject that came up repeatedly was the conservation of freshwater supply and midway through the year they all participated in an international student competition run by the FLUOR Corporation which was open to K-12 students, that focused on just that. Using the idea of the 2,000 year-old Banaue Rice terraces in The Philippines, the competition architects asked students to design and build an elevated structure using limited household materials that would employ gravity to move water with numbered resources from level to level, simulating the irrigation system of the real rice terraces. The FLUOR Competition positioned students to compete with classrooms around the world using a point system that awarded points based the movement of water carrying beads down successive levels while deducting points based on how much of the offered materials were used in the working model. STEAM Teamers were divided into four teams and each created different and successful models that moved beads swiftly from shelf to shelf. I saw that they relished the opportunity to compete with their unknown peers from other countries, as they enthusiastically sought to out-innovate, all while practicing the important lessons of teamwork and good-sportsmanship which is the heart of STEAM Team. In my language arts class we play a game I developed for learning Greek and Latin roots. These roots form so many words in English, it’s a great way to give real kids ownership of the language. They get to truly shine, even in the world of adults. All year we play the game, until we can pick apart words we know, and words we don’t, to see if we can find out what the roots in them tell us about their meanings. The game is really fun, and the kids enjoy it, regularly choosing to take a different card because the first was too easy, or to have the word in English and find the root in Greek or Latin. It starts slowly, but by the end of the year they can’t believe what they know. It’s a marvel to watch them grow in their knowledge and confidence. At the end of each term parents and siblings are invited to come play with us. It’s fun for everyone to take the challenge. It was an unschooling-inspired idea. I proposed we go to the Natural History to see all the writing underneath the main headlines, meaning the names of all of the displayed items, but in Latin. We also knew there would be many, many words in English the kids could pull apart. The rules were simple. When we walked in the door, the hunt began. The students could use any word they saw, and the points were based on which ones they saw, and knew, and could translate. All the words in the museum could be used. The prizes were small sillies. The real prize was the order in which the students got to choose from the dark and mysterious bag of dollar-store magic. And they had to keep the prizes still in there a secret from the others while they selected their item. We wandered grabbing roots from North American mammals, shells, early humans, gems, a few bugs and birds, and ended under the big whale hanging over the hall of marine life. They did an honor-system tally, some chose to team up and average their scores, and everyone won, big time. Each kid had 40-80+ roots, translated! It was really impressive. We all ran into the jellyfish hut, and oohed and ahhed at the projection of them above us as we lay there together, finally relaxing. Having started at the playground on a beautiful June day we ended there as well, enjoying the weather and the wonder of these very cool kids. It was so much fun! Miranda B. Norris has been teaching Language Arts in the homeschool communities of NYC and FL for 10 years. Mom to three free-range kids, she is a writer, artist and Brooklyn-dweller.